In Copenhagen – one of the most bike-friendly cities in the world in which 36% of its inhabitants cycle to work or school, and which has committed to increasing that figure to 50% by 2015 – there are controversial voices coming from unexpected places. According to the Danish Cyclists' Federation and Wonderful Copenhagen, the official tourism organisation for Denmark, the sheer success of the drive to get more locals and tourists on bikes is creating a dangerous, intimidating and unpleasant climate for cyclists in the city. "In Copenhagen, we have quite extraordinary problems around cycling congestion," said Aneh Hajdu, of Wonderful Copenhagen. 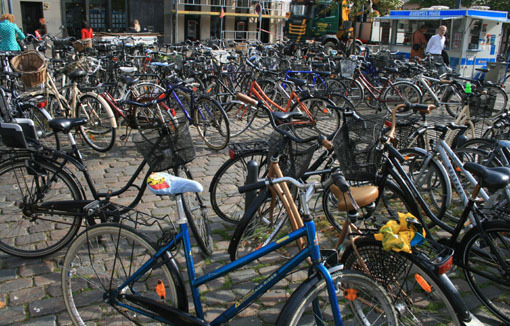 "I don't take my children on their bikes into Copenhagen at rush hour any more. It's too dangerous and scary. I just wouldn't risk it." As numbers increase in the cycle lanes, says Hadju, so behaviour deteriorates, with jostling and cutting-up becoming more frequent. "The locals rush past the foreigners, who are often uncertain on their bikes and going slowly," she said. "The locals get impatient and therefore become more threatening." So what happens when the critical mass of cyclists grows faster than the government can improve their uban environment? In rush hour, there are enormous numbers of cyclists fighting for space on Copenhagen's bike paths, which become cramped and packed. "As numbers grow and they fight for space, cyclists are becoming more aggressive and reckless in traffic. I increasingly see people bringing themselves and others into dangerous situations," "They break the laws and use their bikes in completely reckless ways."